Our Durham NC parking lot professionals are the best in the business and use high-quality painting tools and equipment along with high quality traffic indicating signage. We strive to provide the highest customer satisfaction in the state. 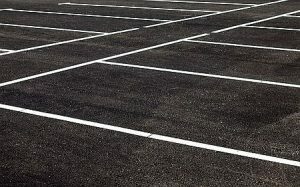 Unlike other parking lot services around Durham NC, we make sure that all surfaces are correctly prepared to guarantee the greatest adhesion and endurance. Durham NC is one of the bigger cities in North Carolina and is part of the Triangle, which includes Raleigh and Chapel Hill. It is very popular among tourists and has over nine million people every year. People love coming to Durham NC because there are innumerable things to do. Whether you are interested in performing arts, visual arts, exciting nightlife, unique shopping, or beautiful natural experiences, Durham has something for everyone. If you are interested in sporting events, outdoor recreation or even touring local farms, Durham is the place to be. Every single one of our crew members have adequate knowledge and experience lining parking lots in Durham NC. We pride ourselves on creating lines which are sharp and straight. We follow the requirements of the ADA to make certain your company conforms with all ADA rules and regulations. We recognize that store front parking is a crucial factor to whether your business gets the sale over your competitors; that’s why the crew at Unlimited Professional Services is adamant about doing the best possible job for you. When it comes to line striping parking lots, we will work with you to show you why we did what we did especially when it comes to the rules and regulations set by the ADA. When it comes to parking lots, we are an one stop store for all your parking lot needs. In Durham NC the oxidation process on new parking lots starts promptly which, over time, causes the pavement to slowly become light gray in color. This is disappointing since a newly paved lot is typically a beautiful, dark black color. Because of oxidation, a newly paved parking lot soon becomes cracked and uneven. This is why it is critical to perform sealcoating on pavements. Sealcoating is the ultimate answer to assist in preventing oxidation. Unlimited Professional Services is the one only one to call in Durham NC for asphalt concrete repairs. 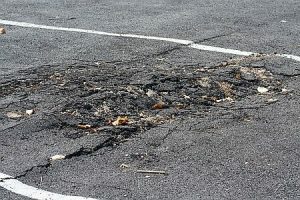 We do everything from completely restoring the surface of your whole asphalt parking lot to mending a damaged curb and repairing a simple pothole. It is widely known that the parking lot to any office or store location is among the more important facets of a business location. Generally speaking, most people do not like going to a business that has a bad parking lot, such as one that’s old, cracked, uneven or has a lot of potholes. So, if you think about it, a parking lot actually gives the first impression about your business when someone drives up for the first time. When it comes right down to it, you don’t want to lose business on account of your parking lot, that is for sure! It’s hard to ever truly be ready for a snowstorm, especially down here in the south where we just aren’t all that use to it. As beautiful as a nice snow is, it can and usually does cause so many different problems. If you need to get your parking lot and Durham storefront areas cleared of snow so that you can open up, we’ve got you covered. Trying to remove the snow yourself can take hours on end and you’ll probably only make a dent. When it snows here it really tends to be heavy, but we’re prepared to handle that. We can get you cleaned up and ready to go in a very reasonable amount of time! So, when you’re snowed in and need help, call Unlimited Professional Services!